There’s an old saying, “If you want to make God laugh, tell him your plans”. He must be chuckling a lot at me lately. Since moving back to my home state two years ago, Hubby and I have been looking for just the right house to buy. We knew we wanted a house that “spoke to us”, had character, and was something that we could put our own mark on. We decided to take our time, pray about it, and knew that with patience and faith the right house would reveal itself to us. As months went by, we looked at many different houses but nothing seemed to be “the one”. We researched all of the surrounding communities, staying open to whatever felt right. However, one thing I was not considering was buying a home in the small town that I was born and raised in. After all…… it was a Mayberry! Very little had changed since leaving there 30 years ago. I had even stated on several occasions, “I won’t ever be moving back there!”………but…..as it is so often the case,when I tell God what I want……and exactly how I want it……… and exactly when I want it…….sometimes His answer is not the one I expect. While going through my daily ritual of perusing real estate sites to see new listings, I came across this house. Immediately intrigued, I felt as though it was familiar, that I somehow knew this house. Then I realized that I did recognize it, because……it was in Mayberry…….my childhood hometown……..you know,………the town I would never move back to. As a child, I remember driving by this house with my mother, and wondering what it must look like inside, just knowing that those big spacious rooms were beautiful. Ms. Irene built the house with her husband in the early ’70’s, a prominent businessman in Mayberry at the time, but she ended up moving into the finished house as a widow when her husband suddenly died right before the house was finished. She lived out the rest of her life there, and as the one and only owner, she finished it with her own personal tastes in mind. When Hubby and I couldn’t stop thinking about it and viewing the online pictures over and over, we decided to go see the house in person. And, of course, we loved it. But it was in Mayberry! 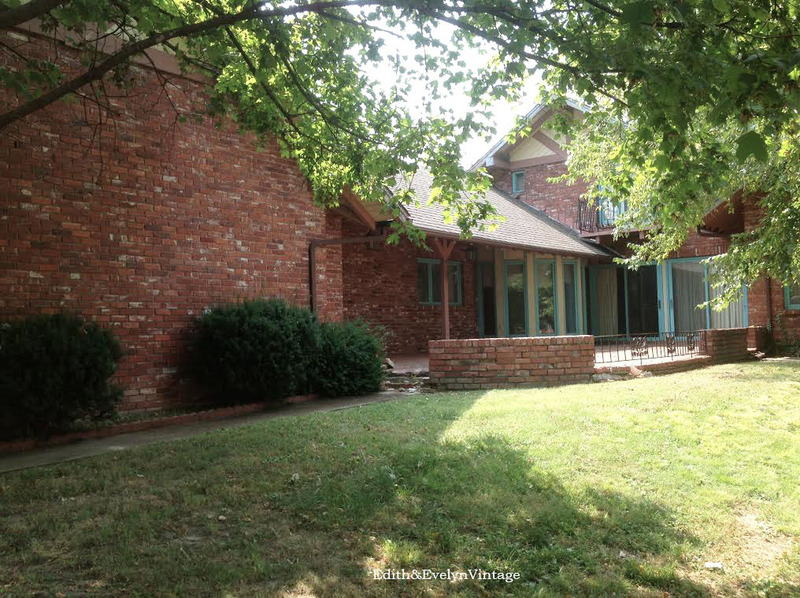 We ended up going back several times, each time trying to convince ourselves that it was not “our” house, because after all 1. it was in Mayberry, and 2. it was a total renovation, way more than we wanted to tackle. But, it didn’t work. I could hear God chuckling through every room of that house……. It didn’t appear that it had been updated since it was originally built and would need extensive renovating, but undeterred, Hubby and I both started dreaming about what the rooms would look like when redone. So…..to make a long story short, yes……we bought it. Yes, it’s true…….God is laughing and I am eating my words! Here’s just a taste of what we saw when we looked at it the first time. You can definitely get a sense of Ms. Irene’s taste in decor………..she loved pink, turquoise, and green. The outside of the patio area. Ms. Irene even painted the trim on the windows turquoise…………hmmm……love a little bit of turquoise myself, but this will definitely have to go! 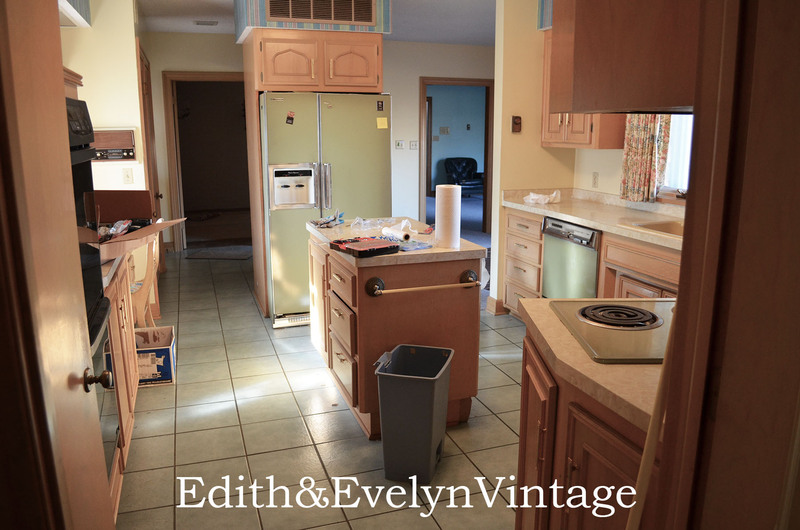 The kitchen with all the original avocado appliances…….remember those? This cabinet sat right in the middle of the kitchen and gave it a very tight, closed in feeling. It had to go! The formal dining room with original parquet floors, built in hutch, brick wall, and stained glass window……….and of course, green “flocked” wallpaper! Beautiful original French chandelier…….very excited about that! Pink shag carpet was in several of the rooms, including the formal living room and the master bedroom. Custom draperies were throughout and probably cost a pretty penny when they were put in, but they will definitely be replaced. Chandeliers were in every room…….now that’s something Ms. Irene and I can agree on! And many of the rooms had original lead glass windows! The Master Bedroom is huge……and it was wall to wall pink shag carpet. It was one of the first things we took out. And Ms. Irene dearly loved wallpaper…….and roses…….did I forget to mention the roses? This entire bedroom, including three closets, is completely covered in pink and green rose wallpaper. Oh my. This should be fun. One of the four bathrooms……..this one is pink in theme……….I also have a green one and two blue ones. However, there is a positive in this bathroom……..the original marble countertop and lovely leaded glass window! I would have probably bought this house just on the foyer alone. It is beautiful with a gorgeous curved staircase with iron railing that was hand forged at the local foundry when the house was built. Planked ceiling…..yay!………and did you see the chandelier………it’s huge……….Ms. Irene had very nice taste in lighting! Wood paneled study with original parquet floor. The wood paneled study is simply beautiful with the original parquet floors. This will be my office when it is finished and I can’t wait to get started on it! There are fourteen rooms in all so this is just a little taste, but you get the idea……….they are all stuck in 1973! Renovation began with the kitchen. This is a major leap for Hubby and I. We are basically DIY virgins when it comes to home renovation. I have always painted and wallpapered…..you know, the easy stuff……..and Hubby?……..he’s completely allergic to any kind of home remodeling. Or at least he was. I’m not sure what has come over him because he is loving the entire process! Well…..except when he runs into something that he doesn’t think he can do (like electrical). I just tell him, “How hard can it be?” and hand him a YouTube video to watch! So far, it’s working! Kitchen cabinets have come out…………………. Tile floors have come up………not easily……..but they did come up! And the popcorn ceiling has come down. Ugh. Now it’s time to start putting it all back together…………..my absolutely gorgeous farmhouse sink is finally in……………we had to literally modify the sink cabinet for it to fit. We have covered all the soffits with wood which will visually extend all the cabinets up toward the ceiling. And we have finally finished planking the ceiling, adding the crown moulding, and decorative trim to the existing cabinets. And we have hung a couple of chandeliers………Ms. Irene is surely smiling about that! I am going to pickle the planked ceiling and next week the oak hardwood floors will be going down. And….surprisingly…….we have done all of it ourselves…..and on a tight budget! We have not run into too many snags that we couldn’t fix, the word “divorce” has only been mentioned once, and there has only been one injury………..it was his fault really………and yes, it probably did need stitches……….but the frog tape from Lowe’s worked fine and we were able to continue with the renovation without interruption! My favorite…. The planked ceiling! Wow ! What a difference ! It is beautiful! Lots of hard work but the results are stunning! Completely addicted to your blog. I know just how hard the work is having worked on a Grade 11* Elizabethan stone farmhouse back in the UK. Your attention to detail is incredible. Just adore what you are doing. Thank you Janette! Stay tuned, the master bedroom reveal is coming soon! Did you actually scrape off that floor tile and the popcorn ceiling coating without wearing a mask? If so, tsk-tsk! I adore your kitchen. One of my all-time favorites. On the other hand, you bought a perfect example of a time capsule late mid-century house (admittedly, it looked rather like a funeral home!) and are turning it into something new. If you decide to rid yourself of the colored bathroom fixtures, retro renovation site will help you find buyers who will love to have your fixtures. Cindy, I just found your blog from a link in Country Living showing the finished kitchen. I love the house and what you’ve accomplished! I have great ideas for our home, but my husband is not a willing participant! Lol! I am very excited to see more! Thank you so much for your kind words! My hubby had his doubts in the beginning, but when I explained about all the new, cool tools he would be able to get, he found his excitement! Lol! Just found your blog. I was on Hometalk and went from there. Love your home. I was looking at all of these “before” pictures and when I got to the foyer, I realized what you saw in the house!! Could not see your “vision” until then! !LOL Can’t wait to see the finished home. Good luck and have a safe journey. Will be watching!! Can’t wait to see the home finished! I’m sure it will be a diamond in the rough! I loved the story that went with the house and how you came to choose it. You will make it beautiful! Love all the chandeliers too! This is going to be fun to watch! What a house, and what a project. Wondering if, with neutral walls and floor coverings, you couldn’t get away with repurposing the MBR custom pink drapes in the formal living room? Might not be so bad without all the other pink… and roses…. and pink, pink pink… wow! One does wonder what the house may have looked like had her husband not passed away so untimely. What a beautiful home! I know you are having fun making it your own with your special touches! It will be a masterpiece and befitting of you both! Carry on and keep posting pics!! Love it! Wow! You guys are ambitious but how exciting! Cant wait to see how it progresses. Oh my Cindy! Great story about finding your home! Never say never, eh?! It must have been magnificent in the 70’s!! Our house was built in 1971:) That foyer truly is beautiful – love the railings! I will enjoy following along with your renos and I’m sure it’ll be a real beauty when you’re done with it!! Cindy, it certainly is a labor of love. Can’t wait to see this when you’re all done!! Oh Cindy, I can see why you fell in love with this home and after many months of lots of hard work it’s sure to be exquisite because you have exceptional taste. That and you’re ovisiously not afraid of hard work and lots of it. I’m so happy for you and thank you so much for sharing your great adventure with us. Oh, that stairway must lead to heaven because it’s so gorgeous! Thank you Rosemary! Your kind words mean so much to me! It’s looking good Cindy! I didn’t realize it was a total renovation project…It’s going to be great when it’s all finished. I LOVE that staircase. Thank you Judy! I have to keep reminding myself that this is a marathon, not a sprint!